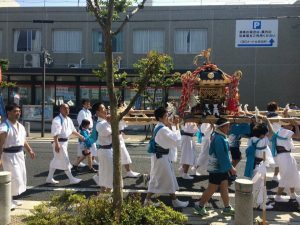 Every year in May the local Miyazu Festival takes place in the downtown area and surrounding neighborhoods of Miyazu City. For the three days of the festival, portable shrines belonging to the city`s two major shrines: Sanouguu Hiyoshi Shrine and Wakinomiya Shrine are pulled through the streets accompanied by taiko drummers beating out rhythms on taiko drum floats, and traditional flutists. Dancers performing traditional Shinto dance known as Kagura also follow the stream of floats, stopping occasionally to perform their dances. On the third and final day of the festival, the city’s inhabitants gather in the streets of the downtown area as stalls selling festival food and games are open in the evening during the festival`s final performances. 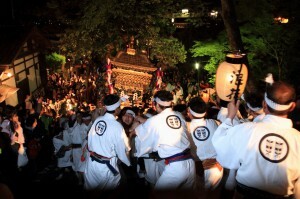 The conclusion of the festival includes lion dancing and nerikomi, the ritual in which the portable shrine is returned to the shrine. 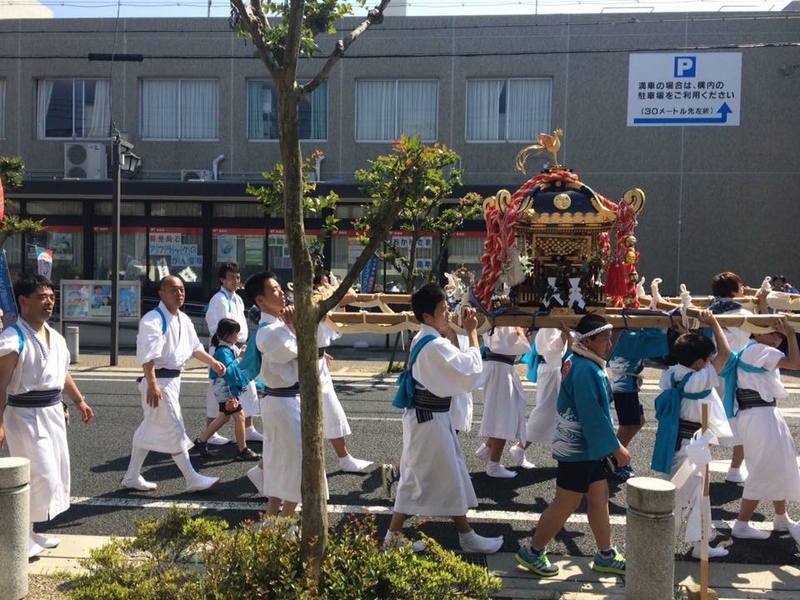 During the nerikomi ritual, the portable shrine carriers lift the portable shrine and run back and forth through the streets before returning to the shrine. At Sanouguu Hiyoshi Shrine, the portable shrine is carried up the steps of the shrine after the nerikomi ritual ends which is quite a sight to see. People line both sides of the step to watch the extremely heavy portable shrine be carried up the long flight of steps.